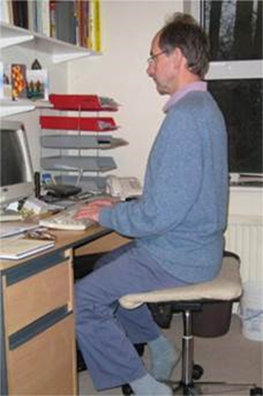 There is not just one correct position for sitting at a desk. There is really a whole spectrum of satisfactory positions and obviously in the course of a day’s work variation will help reduce fatigue. It is perfectly possible to sit completely upright with the body in the same shape as it is in standing, but supported under the seat bones and not by the legs via the hip joint. 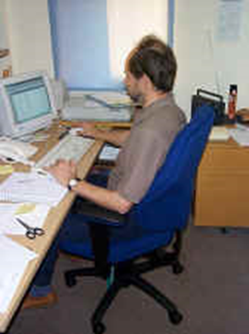 This will obviously use exactly those muscles that are used in standing and must be a good way of sitting for deskwork as the body is really just standing from the seat bones. I refer to this as Alexander sitting as this is exactly what is taught as part of the Alexander Technique. Note that this is much easier if the thigh is angled down from the hip to knee and becomes impossible if the knee is significantly above the hip. Most people however will choose to use a backrest and this must support the pelvis. 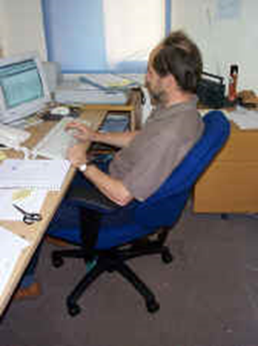 If you wish to sit very vertically it would still help to have the seat angled downwards from hip to knee. Obviously, the extra force from the back rest will tend to make you slide down the seat. There is therefore a happy mean to be looked for between the seat angle and amount of pelvic support. Alternatively, the seat can be returned to the horizontal and the backrest reclined slightly to maintain the open angle between the trunk and thighs. If the eyes are to face directly forwards to a monitor for instance when the body is slightly reclined there must be some flexion in the spine or neck and this is best achieved by spreading it over a much of the spine as possible i.e. let the middle part of the back bend where lumbar support normally stops it bending. The body does not have to be kept strictly in the standing shape if we are writing at a desk with the eyes pointed towards the paper. The whole spine can be evenly curved without harm. This sort of position can be taken further back by lowering the seat, tilting the seat back slightly, reclining the back rest more and allowing more bend in the mid back so that the head is still facing forwards. 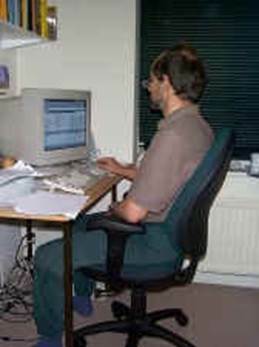 This position is still a perfectly satisfactory working position so long as the backrest incorporates pelvic support. The seat used for all these demonstrations is the Pelvic Posture 20-25 Universal Task Chair. Note that the work that needs to be done in the upper back muscles is a maximum in the most upright position, even if the pelvic support is good, and is much reduced in the more reclined position. Looking to the future, it is perfectly logical to argue that the more reclined position reduces the muscular effort in the upper back. If so, an even more reclined position, with a really effective head rest would go one step further and reduce the muscular effort in the neck. (Note that holding the heavy head stationary during a day’s work with very little movement is exactly what muscles were never designed to do). 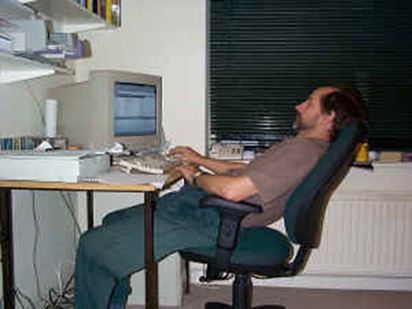 The last stage in the spectrum of sitting positions is what many of us tend to do at least some of the time..........particularly when so much work can be done just with the "mouse hand" and a microphone. Although universally condemned there is actually nothing wrong with this position. It is the slouched position with the pelvis balanced on the gluteal muscles, the spine evenly curved up to the shoulder blades, which is the next point of support, and the top of the chair back being used as a headrest underneath the occiput at the base of the skull.